Vedic Maths is an excellent tool for developing interest towards numbers and making calculations a fun. 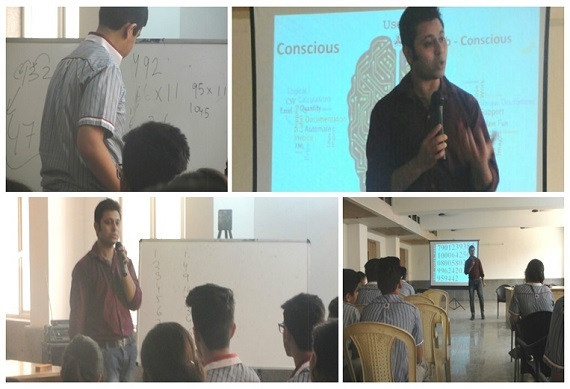 With this in view, the school organized a workshop on Vedic Mathematics for students of class XIon 19th of April 2016. The resource person for the lecture was Mr.Muhammad Faisal, who is an active associate of Vedic Maths Forum India and is a three time World Memory Record holder. He shared the brilliance of Vedic mathematics and taught few tricks to the students to calculate faster and with accuracy. He gave various examples and in hand practice to the students to grasp the tricks spontaneously. Students showed keen interest in the knowledge imparted by Mr. Faisal and participated in the workshop with zeal and enthusiasm.